ShukerNature: STAR STEEDS - GALLOPING HOME TO ITS OWN BLOG! STAR STEEDS - GALLOPING HOME TO ITS OWN BLOG! 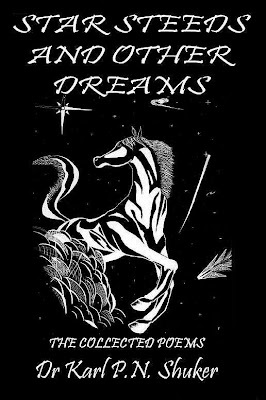 Whereas my first 14 books and numerous articles have all focused to greater or lesser extents upon non-fictional zoology, cryptozoology, Forteana, and mythology, my 15th book, Star Steeds and Other Dreams, is, as its subtitle The Collected Poems reveals, a collection of my poetry. As this is such a departure from my more familiar writings, upon reflection I felt that it deserved its own, completely separate blog. And with that in mind, I have now created one for it, entitled - surprise, surprise! - Star Steeds and Other Dreams, at: http://starsteeds.blogspot.com which I hope that you'll visit whenever you have time, and where I'll be posting selections of my poetry, not only from this book but also various unpublished poems of mine never before seen. Star Steeds the book is published by CFZ Press, and is readily available directly from them as well as online from such literary stalwarts as Amazon, Waterstones, W H Smiths, Barnes & Noble, and AbeBooks among many other websites. Thanks to everyone who has already purchased a copy, and thanks also in advance to those of you in the future who do so.